I share here a few things that are helping me to develop my intuition. 1) Sitting in a particular place on a daily basis to meditate. I practice a number of different meditations, one of which concentrates on activating and balancing the Chakras. 2) Visualizing my Pineal Gland bathed in Violet Light and seeing Golden Light streaming down into it to awaken it. 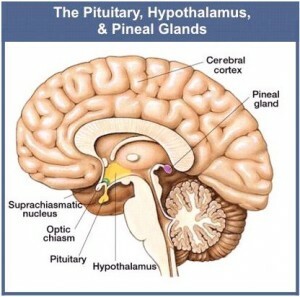 The Pineal Gland is shaped rather like a pine cone, so I imagine the shape and sense it coming to life. 3) Using a mental ritual – I travel in my imagination to a sacred spot to receive intuitive impressions. When I have received the impressions and written them down, I return in my imagination, to my usual surroundings and to normal waking consciousness. 4) Doing the above practices on a regular basis. I believe it is the repetition and reinforcement that trains the brain. 5) Receiving feedback about the accuracy of the Intuitive Impressions. This is very important, as it gives me confidence that I am not just making things up. I find that developing intuition is very compelling, its like a journey into a very interesting and beautiful country. The practice and ritual really seem to help. I hope you will find some of the above ideas useful on your own journey. You could play with the ideas and improvise to find the way that suits you. Everyone is unique. Here is a useful link to more detailed information about the Pneal Gland.